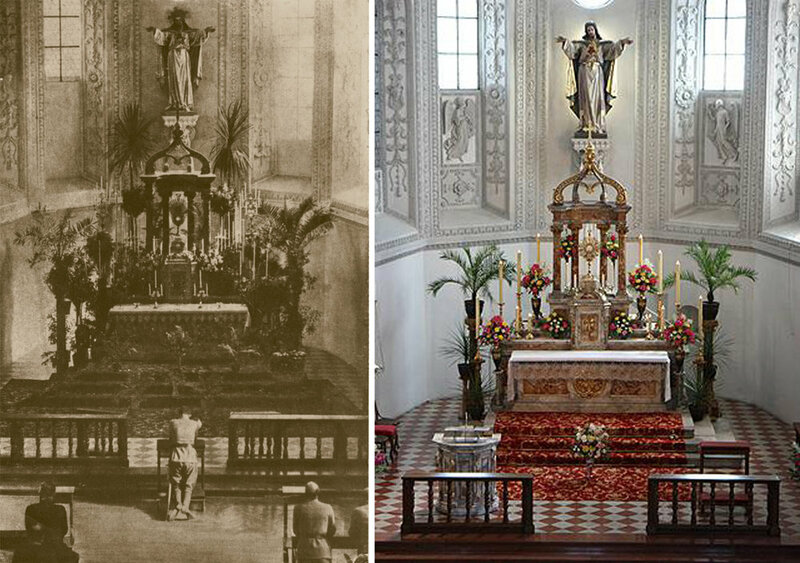 Photo Left: Blessed Karl kneels in prayer at Sacred Heart Church Hall in Tirol, Austria, before the Sacred Heart of Jesus during exposition of the Most Blessed Sacrament, circa 1916. Photo right: The Church today. Closed in 1793 as part of Josephinism reforms, Sacred Heart Church was converted to a storage room, armory, and later a theater hall. In 1912, with the help of Archduke Franz Ferdinand, the Daughters of the Heart of Jesus reinaugurated Sacred Heart. Today, Sacred Heart is as vibrant as ever, with the church serving as a place of pilgrimage with the Daughters of the Heart of Jesus maintaining perpetual adoration of the Most Blessed Sacrament. Since 2001, there has been an annual pilgrimage to the Church. For more information about the Church and pilgrimage, click here. Blessed Karl had a great devotion to the Sacred Heart of Jesus. In addition to a family consecration, Emperor Karl kept an image of the Sacred Heart under his pillow which became a source of solace during his final days. The text and prayer below come from Blessed Karl of Austria: Novena. “Jesus, gentle and humble of heart, form our hearts to be like Your Heart.” On October 2, 1918, Blessed Karl consecrated himself and his family to the Sacred Heart of Jesus. Through being misjudged, slandered, persecuted, risking his life for his peoples, exile, and his painful final illness, Emperor Karl allowed his heart to be conformed to the Sacred Heart of Jesus. Blessed Karl kept an image of the Sacred Heart under his pillow throughout his life, and during his fatal illness. Once when Empress Zita wanted him to get some much-needed rest, she brought the picture out from under the pillow and held it before the Emperor’s eyes. She said that it was absolutely necessary for him to sleep, and that he should ask the Lord for it. He gazed at the image and urgently, yet devoutly, said, “Dearest Savior, please, grant me sleep.” He was then able to fall asleep and rested for three, much-needed hours. My Lord and God, according to the marvelous example of Your servant, Emperor Karl, I too wish to consecrate myself to Your Most Sacred Heart. Hear my petitions and grant my request (mention your intention here) through the intercession of Blessed Emperor Karl of Austria. Amen. English Text by Br. Nathan Cochran, O.S.B. Journey through the Church's tradition of 9 days of prayer as you pray for your intentions. Photographs and story vignettes will reveal the profound life of Blessed Karl.